If you grew up playing Nintendo’s Mario Bro’s you will love this slot. We hate to say this, but NetEnt may have pushed Reel Rush to the top of our favourites list, just for the graphics alone! But the game play is what we’re interested in and that has some pretty good points too. 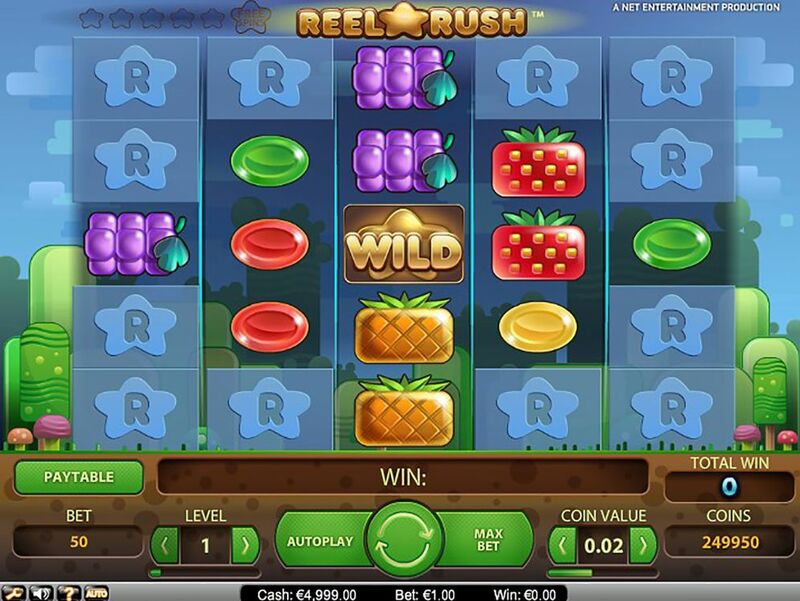 Reel Rush is a 5-reel slot offering a potential 3125 ways to win and includes a massive 97% RTP too! So, if the design didn’t excite you then that surely should have, but just in case you need something else there is one epic feature awaiting you too. Bet Amounts – Betting begins at 50p per spin and can be increased up to £100, which isn’t much when you consider the sheer amount of win lines you could be playing with. That being said, this game can draw you in, so we would advise careful betting so you don’t waste too much of your balance. Wild Symbol – A brown star that looks like its been ripped out of Mario World is your wild symbol. It will substitute for all other symbols in Reel Rush. It will only appear on reels 2, 3, 4 and 5 in both the base game and the feature spins. Scatter Symbols – Reel Rush has no scatter symbol but instead it offers a bit of a twist on the main feature. Some of you may feel the need to avoid the game because it has no scatter but trust us when we say it will not be missed. 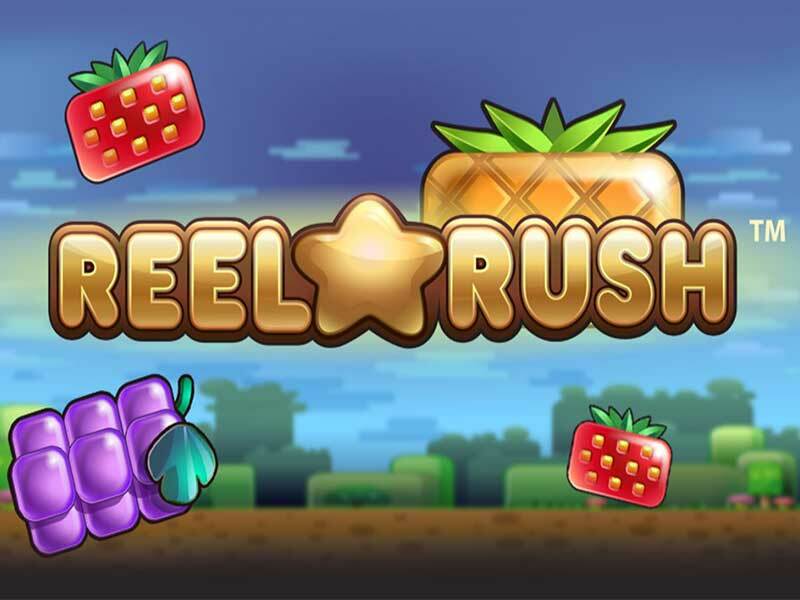 Other Symbols – All the symbols in Reel Rush are fruit shaped in nature and reminiscent of retro video game icons of old. You will see there is the strawberry, orange, lemon, melon, grape and blueberry shaped icons as your higher value symbols. With the lower value symbols being sweet shaped and in the colours of red, orange, yellow, green and purple. Plenty of symbol matches to be made here creating plenty of win options. Re-spin Feature – Due to the lack of a scatter you may be wondering how the bonus feature will work. Well Reel Rush has a little twist up its sleeve for you, the feature is played during the base game! You may have noticed that when you first play the reels, that not all the spaces are uncovered and the four corners have R’s covering spaces. The way it works is simple, every time you create a winning combination you will uncover some of the R spaces and be offered a single re-spin of the reels. For each consecutive win more spaces will be uncovered and another re-spin will be awarded. After the 5th consecutive re-spin has been given you will have a clear reel full of symbols and will be allocated 8 bonus spins! If you land a win and get your re-spin but you then incur a loss on that spin, then the R spaces will be recovered and you will be back to the original layout of the reels. We understand that as there is a severe lack of features and extra’s the natural reaction would be to switch off; but don’t. Reel Rush is a fantastic game full of endless possibilities despite everything its missing. It definitely connects with you once you do start playing, from the nostalgic video game sounds to the graphics that take you back to childhood. That aside the wins do occur and quite often too. We got to the 8 bonus spins on a few occasions, though it did take some time to get there it was worth it in the end. A full reel of symbols and 3125 ways to win for 8 spins is insane when you really think about it!